During the Second World War Docking was a busy and at times a dangerous place to live. For a relatively small village it was defended by quite a large number of defences and being so close to two operational airfields, RAF Docking and RAF Bircham Newton, Docking often found itself in the front line. Built in 1939 as the Second World War began, RAF Docking was planned as a decoy and satellite airfield to nearby RAF Bircham Newton but by mid-1940 Docking was being used regularly for frontline operations. These included, in June, the air support of troops of the British Expeditionary Force being evacuated under fire at Dunkirk. RAF Docking with its grass runways was a busy airfield for the rest of the war. It was run as part of Coastal Command, and home to many squadrons taking part in offensive, defensive, meteorological and training flights. Because of its position near the North Sea coast it was also used as an air-sea rescue base and emergency landing field for bombers. Many different aircraft types flew from Docking. They included Ansons, Hudsons, Spitfires, Hurricanes, Wellingtons, Venturas, Swordfish, Lysanders, Mosquitos, Gladiators, Beaufighters, Blenheims and Hampdens. Hundreds of RAF and Army personnel lived in accommodation in and near to Docking; there were gun sites to defend the airfield. There was constant flying on operations and training sorties, and occasionally attacks by German intruder aircraft. Crashes and crash landings were common in the locality, some in the village itself. Today little is left of the airfield, which was returned to farmland. One mile north of Docking, at a fork on the B1153 road, is a small modern memorial that commemorates all who served there. Docking seems to have been guarded by a large number of defences, some of which survive to this day. 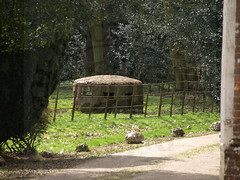 The Norcon was a small circular pillbox named after the company that manufactured it as a private commercial venture. It was made from a concrete pipe 6 feet (1.8 m) diameter and 4 feet (1.2 m) high; the walls were 4 inches (10 cm) of non-reinforced concrete with several cut loopholes. The pipe would be sunk into the ground over a pit that would provide a total of 6 feet (1.8 m) headroom. The standard model had a roof made of timber, corrugated iron, and earth. 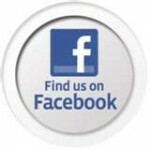 Some installations were fitted with a concrete roof, while others had no roof at all. The walls were given extra protection by a layer of sandbags. The exit may be via an open roof, through a hatch in the roof or through a low entrance cut into the pipe to a slit trench. Although relatively few were actually built, Norcons were found all over the United Kingdom, from southwest England to the Orkney Islands. 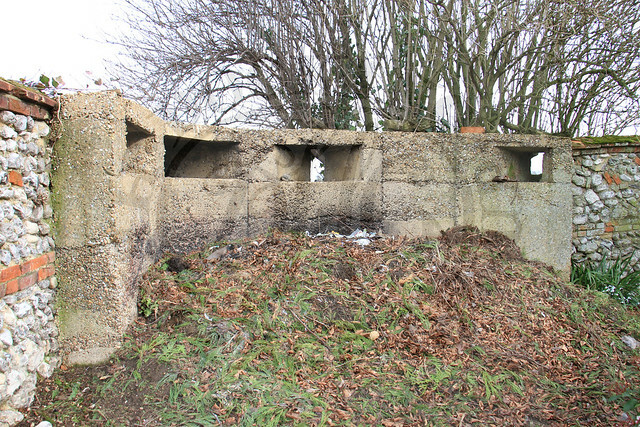 Because they were made of un-reinforced concrete, most of them have succumbed to the ravages of time and the British weather, only twenty-seven Norcon pillbox sites are now recorded in the Defence of Britain database. Docking is unusual in that it has FOUR surviving Norcon pillboxes, all with concrete roofs, which is possibly the highest concentration of their type in the country. As part of the defence strategy in World War 2, many defended places had ‘Loopholes’ inserted into existing buildings. 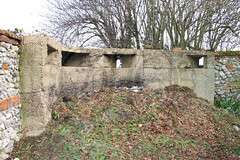 Existing thick walls and heavy buildings provided a ready-made alternative to a pillbox and many were converted to defensive positions by the simple expedient of adding embrasures to them. Whatever may be lacking in protection was made up for by convenience and perfect camouflage. So far we have discovered three loopholed walls surviving in Docking, all of which consist of flint walls strengthened with several tons of concrete on the inside turning them into very substantial structures. The wall in the picture is in a garden in the village. The Spigot Mortar or “Blacker Bombard” was invented by Lieutenant-Colonel Blacker with the aim of providing cheap and easily produced weapons after most of the British Army’s heavy equipment had been lost at Dunkirk. It fired a 20lb fin-stabilised high explosive mortar bomb propelled by black powder, and had an effective range of 100yds in its anti-tank role and up to 450yds when firing a lighter anti-personnel bomb. 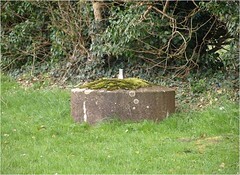 In its static defence role, the mortar was mounted on a steel pin set into a substantial base of reinforced concrete. This was in turn set within a camouflaged weapons pit to offer some protection to the three man gun crew. A portable mount was also available, but weighed around 350lb and took 3 men to move it. The spigot mortar was rejected by the regular army but saw service with Home Guard and airfield protection units from 1941-1944. We know of two surviving spigot mortar points in Docking, situated less than 100 meters of each other. The most unusual and certainly the rarest surviving defensive structure we have surviving in Docking is a Tett turret. 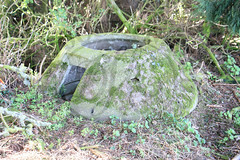 It was a small circular one man pillbox named after its inventor H.L. Tett and manufactured as a private commercial venture by Burbridge Builders Ltd of Surrey. It comprised a revolving concrete turret mounted on a ball race that allowed it to be turned easily. 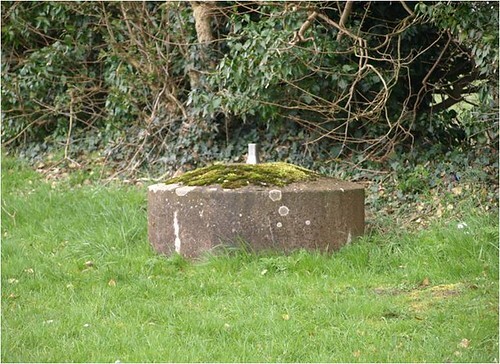 The turret was set above a pit; in early designs, the pit was formed by a standard section of concrete pipe 4 feet (1.2 m) in diameter. The turret was a 20-inch (50 cm) high truncated cone of reinforced concrete weighting 1,456 pounds (660 kg) with a single embrasure and several spy holes. 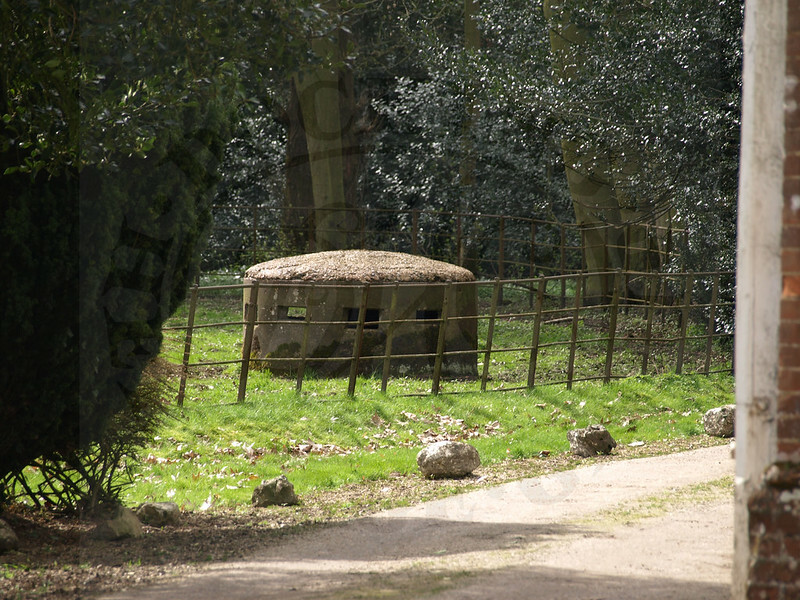 The War Office judged the Tett turret to be too cramped and not bulletproof against heavy fire, its isolated nature did not allow adequate command and control and the open top was vulnerable to a well-thrown grenade. The most striking feature was that the only way in and out was through the top – there was no way to escape without being exposed to enemy fire. Burbridge went back to the drawing board and came up with a new version that instead of being positioned over a pipe was placed on a concrete slab over an underground chamber of brick or concrete slabs. This allowed access from a tunnel or slit trench to the rear. The company’s brochure shows a wooden seat suspended from the turret by a metal frame. Despite initial enthusiasm, orders for Tett turrets did not materialise, that and a shortage of material to manufacture them meant that very few were actually made. Out of a total of 100 that were produced only 31 were sold. Many of those have been destroyed and they are now very rare, only six examples are recorded as surviving throughout the country. Docking can add two more to that total, ours however differ from the other know surviving Tett turrets in that they are linked together by a concrete tunnel, a unique layout which has not been seen anywhere else. These Tett turrets are in fact so rare that we are currently in the process of having them listed with English Heritage. At a campsite on the edge of the Docking parish, close to the site of RAF Bircham Newton, a set of WW1 practice trenches dug by the Lovatt Scouts are currently being investigated. It is also believed that these trenches were used in WW2, possibly by auxiliary units attached to the Home Guard, and would probably have had a connection with some of the defences in Docking. These are just a few of the many wartime defences that still exist in Docking. There were or course many more throughout the village and we know the locations of a lot of them but there are probably many more to find and record. Being so close to RAF Docking, RAF Bircham Newton and a dummy airfield near the next village of Sedgeford, enemy attacks were common. 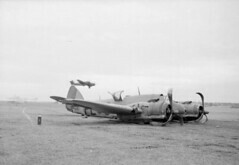 Sometimes aircraft arriving back at Docking were followed by German fighters and bombers which then attacked the airfields and surrounding areas. Although many of the bombs landed on the airfields, some landed in the village itself. Some attacks though were more serious. One such attack took place on 6th January 1941 when Docking was subject to a bomb and machine gun attack. Eight bombs fell near Burnstalks, the old workhouse just to the west of the village damaging the road and power lines and Hall farm near the church was machine-gunned. The following quote, part of our Oral History collection, comes from the wartime memories of a Docking resident and gives a personal insight into life in the village during the war as he remembers air raid practice at school and his parent’s lucky escape from bomb damage to their home. “When we were at school we had the air raid shelters in what was called Bray’s pasture. We had to go through a gateway in the wall and there were dugouts all along the wall. We used to practice every so often. They would say “There’s an air raid on, get there quick.” Mr Spooner, the schoolmaster, would see who was in – and then out. One Saturday night I was in Gardner’s cottage, near the church. I used to sleep there at my aunt’s when mum and dad were on ARP [Air Raid Precautions] duty. There was an air raid that night and they dropped some incendiary bombs and that lit everywhere up like daylight – you could see the church clock. One of the bombs dropped on the cricket pitch on the field behind mum and dad’s bungalow just up Bircham road – it killed a cow. It wasn’t just enemy attacks that people living in Docking had to worry about. Many aircraft returning damaged from raids over enemy territory crash landed onto the airfield but some came down short and crashed closed to the village itself. 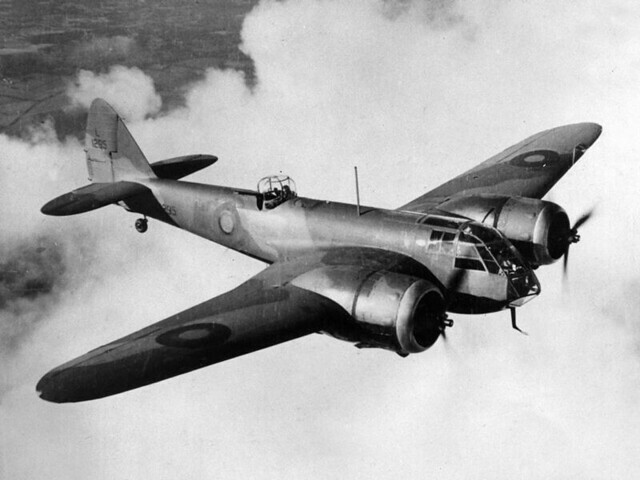 In May 1940 a Bristol Blenheim belonging to 235 squadron lost control in cloud and spun into the ground close to the village. In September 1940 two Bristol Beaufort’s crashed while attempting to land, one stalled and fell from the sky during a night landing while the other, damaged by flack, flew into the ground. In October 1940 an Armstrong Whitworth Whitley bomber returning from a raid over Germany crashed and burned about half a mile east of Docking Church. In December 1941 a Lockheed Hudson crashed after a failed night take off. In February 1942 saw two more Hudson’s crash land, one on the airfield and one in the countryside just beyond. In May 1942 two heavily damaged Hudson aircraft crashed during emergency landings, one of them hit a gun pit at the edge of the airfield killing an army AA gunner. In February 1943 a Hampden crashed after take off and burst into flames near Docking station with a live torpedo still on board. This resulted in the evacuation of several houses. These are just a handful of the many incidents that happened at Docking. Unfortunately many of these crashes resulted in the serious injury or death of many of the crews. Luckily it seems that no one in the village came to any harm although it could easily have been a very different story. The large presence of servicemen and women who were billeted in Docking and passing through changed the social mix of the village for the duration of the war. A number of squadrons that found themselves stationed at RAF Docking came from across Europe and beyond. These included Dutch, Polish and Canadian squadrons. During their time off duty Both the WAAFs and the RAF airmen joined in with village life. The public houses were of course a favourite meeting place. The Railway inn was a favourite with those based at Docking as it was the closest pub to the airfield and railway station although all of Docking’s pubs found themselves regularly frequented by airmen and women looking to escape the stress of the war. Fights were common outside the pubs but they usually ended with those involved buying each other drinks. Those who were not taking part in the conflict directly did their bit to help. 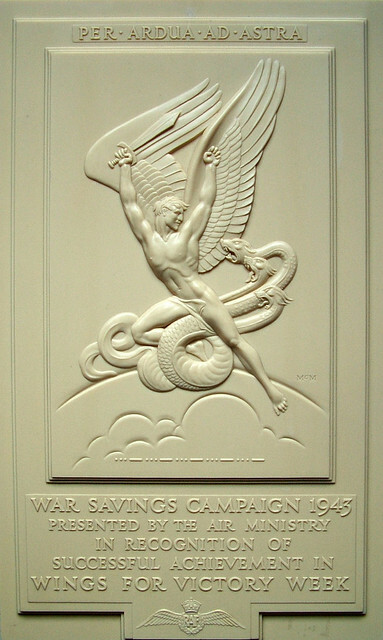 During the war year’s people were encouraged to save their money in Government Savings Bonds, National War Bonds, Defence Bonds or Savings Certificates. They could also deposit their money in the Post Office savings bank. The government greatly simplified things by suggesting that if the appropriate amount of money was saved, extra tanks, planes or warships could be built although the true purpose of the scheme was to take money out of circulation and help minimise the demand on the public’s demand for goods. To encourage people to save, special savings weeks were held such as ‘Warship Week’ ‘Wings for Victory Week’ ‘Tanks for Attack Week’ and ‘Salute the Solider Week’. During these weeks events were organised to help raise funds. Each district was set a target for the amount of money it was expected to raise, for example during Wings for victory week in 1943 the target for the Docking district was £60,000, about the cost of a Lancaster bomber and a Mosquito aircraft, with Docking’s share being £4000. Each village in the district had its own target and held its own events to help raise the money. This particular week was very successful as the amount of money raised totalled £125,000, a sum that would be difficult to reach today. Unfortunately not all savings weeks were as successful and not every target was met. For every successful savings the district was presented with a plaque as a thank you for their fund raising efforts. This is just a taste of life in Docking during World War Two. We have much more information about this period in our archives but are always looking to record more about this important part of Docking’s history.